Other Famous Ancestors. Click here. Ancestral homes. Click to see where they lived. Click on tartan square above to hear the name pronounced. These pages and information there in were made up for my family so they can enjoy the knowledge that I have been gathering for years on our ancestors. They were a royal and interesting lot and I will continue to research them and update these pages. This is just the tip of the iceberg. I hope everyone enjoys my efforts as much as I've have supplying it. Our clan is MacBean. If your sound is on you will hear how it is pronounced. Yep. We are mainly Scots. Who knew? Motto Means" Touch Not the Cat without a Shield". The Macbeans, Macbanes, or Macbains, derive their name from the fair complexion of their progenitor, or, according to some, from their living in a high country, beann being the Gaelic name for a mountain, hence Ben Nevix, Ben Lomond, &c. The distinctive badge of the Macbeans, like that of the Macleods, was the red whortleberry. Of the Mackintosh clan they are considered an offshoot, although some of themselves believe that they are Camerons. It is true that a division of the MacBeans fought under Lochiel in 1745, but a number of them fought under Golice or Gillies MacBane, of the house of Kinchoil, in the Mackintosh battalion. This gigantic Highlander, who was six feet four and a-half inches in height, displayed remarkable prowess at the battle of Culloden. "In the time of William, first of the name, and sixth of Mackintosh, William Mhor, son to Bean-Mac Domhnuill-Mhor and his four sons, Paul, Gillies, William-Mhor and Farquhar, after they had slain the Red Comyn's steward at Innerlochie, came, according to the history, to William Mackintosh, to Connage, where he then resided, and for themselves and their posterity, took protection of him and his. No tribe of Clan Chattan, the history relates, suffered so severely at Harlaw as Clan Vean". BADGE: Lus nam Braoileag (vaccineum vitis idaea) Red whortleberry. PIBROCH: Mo Run Geal Og. NOT much is known of the origin of the name and race of the MacBeans. According to some the cognomen means "the son of the Ben" or mountain; but such a name would be applicable to many Highland tribes, and is not specific enough to convey any distinctiveness. Had this been the origin of the name there would almost certainly have been some local or colour qualification added. But no one has ever heard of a family called MacBean Dearg or MacBean Vorlich. Dr. Almand MacBain, the well-known Gaelic scholar, considers the race and name to be the same as that of MacBeth. Both, he says, came from Moray, a Badenoch branch was actually called "Chlann ‘Ac-al-Bheath," and the name MacBheathain would formerly have been Mac-’ic-Bheatha, or MacBeth. It seems much more likely, however, that the name took its origin from the outstanding characteristic of an ancestor. One of the Scottish Kings of the eleventh century was known as Donald Ban, or Donald the Fair, and the adjective is commonly enough, as a distinction, attached to the name of clansmen at the present day, a notable instance being that of Duncan Ban MacIntyre the Gaelic poet. In the matter of race, the MacBeans have been claimed as a sept of Clan Cameron, chiefly by reason of the fact that some of them fought under the banner of Lochiel at Culloden. But on that occasion a still larger party fought in the ranks of the Mackintoshes, and there is further reason to believe that from very early times the clan regarded itself as a part of Clan Chattan. The Kinrara MS. records several facts of the time of King Robert the Bruce which make it certain that at any rate one family of the name then recognised Mackintosh as its chief. The first reference mentions how in the time of Angus, the sixth Mackintosh chief "Bean MacDomhnuil Mor lived in Lochaber and was a faithful servant to Mackintosh against the Red Comyn, who possessed Inverlochy. "Shortly afterwards the MS. records show, "In the time of William, first of the name, and seventh of Mackintosh, William Mhor MacBean Vic Domhnuill-Mhor, and his four sons, Paul, Gillies, William-Mhor, and Farquhar, after they had slain the Red Comyn’s steward at Inverlochie, came to Cosinage, where Mackintosh then resided, and for themselves and their posterity, took protection of him and his." The same annalist refers to another incident which would seem to show that, a century later, the MacBeans were regarded as distinctly a sept of the same great confederacy. "No tribe of Clan Chattan," the history relates, "suffered so severely at Harlaw as Clan Vean." Mr. A. M. Mackintosh in his History of the Machintoshes and Clan Chattan quotes a number of charters and bands which show that the MacBeans took an intimate part in the affairs of the Mackintosh chiefs. In 1490 Donald MacPaul or Macphail (son of Paul) witnessed a band between the lairds of Mackintosh and Kilravock, and two years later Donald Macphail and Gillies Macphail witnessed a contract between Ferquhard Mackintosh and the Dunbars. This Gillies, Mr. Mackintosh identifies with the Gillies M’Fal who appears in the Exchequer Rolls as tenant of Dulleter in 1502-8, and his son as the William MacGillies MacFaill who signed Clan Chattan’s band in 1543. So far the family were merely tenants of land. 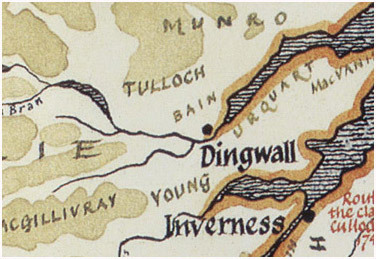 The next head of the house, Paul M’William vic Gillies, who in 1568 witnessed the infeftment of the sixteenth Mackintosh Chief in Dunachton, is designated merely as "in Kinchellye." Even in 1609, when the head of this house was clearly recognised as chief of his race, he was still only a tenant. In that year Angus MacPhail "in Kinkell" signed the Band of Union, "taking the full burden in and upon him of his kin and race of Clan Vean." In 1610, however, Angus obtained a feu of his lands from Campbell of Cawdor, and he duly appears as laird "of Kinchyle" in the Valuation Roll of 1644. Angus’s son John was the first to bear clearly the present family name. He received his sasine of the lands of Kinchyle in 1651 as "John MacBean, alias M’Angus vic Phaill, lawful son and nearest heir of Angus M’Phaill vic William vic Gillies." John’s son and successor Paul took no part in Mackintosh’s feudal demonstration in Lochaber in 1667, but in 1667 he atoned to the Captain of Clan Chattan by giving him a regular bond of manrent in the ancient style, undertaking to "follow him as his chief, with all his men tenants, family, and followers of the Clan Vean, against all men except only the King, Lord Huntly, and the Laird of Calder." Later, with two others, he undertook, for a payment of blackmail, to protect the lands of Strathdearn, Strathnairn, and adjoining districts against the depredations of cattle thieves. From these embarrassments the family seems never to have recovered, and its difficulties were certainly not lessened by the part taken by its chiefs in the Jacobite risings of 1715 and 1745. AEneas or Angus MacBean, William’s eldest son, was a captain in Mackintosh’s regiment in the Earl of Mar’s army, while the fifth son John was a lieutenant. They shared the march into England and surrender at Preston. AEneas is believed to have been living in 1745, so that his brother, Gillies Mor, who played a heroic part then, was not "of Kinchyle" as is generally stated. At the proving of his will he was described as son to Kinchyle and late tacksman at Dunachton, domiciled at Dalmagerry. Among his property was a copper still valued at seven pounds; in the "List of Persons concerned in the Rebellion" he is described as a "brewer "; and it has been conjectured that, his farm at Dunachton having proved unsuccessful, he was the innkeeper at Dalmagerry. Another member of the clan, of the same name, Gillies MacBean of Free, formerly of Falie, also fought at Culloden, but under the banner of Lochiel. He received two bullets in his leg, but was able to leave the field. Coming up with Lochiel, who had been wounded in both ankles, and was being carried out of action by two near relatives, MacBean undertook to convey him to a place of safety whence he might easily get to his own country. On crossing the Nairn at Craigie they were intercepted by some of Cumberland’s men. Compelled to fight, they killed some of their opponents and the others made off. At home the wife of Gillies dressed Lochiel’s wounds, and with a pair of scissors extracted the bullets from her husband’s leg. MacBean lived to be an old man, and has his virtues recorded in a Gaelic inscription in the churchyard of Moy. Still another gentleman of the clan, AEneas MacBean, whose son was afterwards Secession minister at Inverness, was pursued from the battlefield by two dragoons. His path was barred by a torrent, and he was about to be cut down when by a tremendous effort he leaped across. The dragoons followed, but the fugitive making a circuit, again leapt the chasm, and with tremendous exertion he repeated these tactics till his pursuers tired of the effort, and gave it up. He also lived long afterwards to tell the tale. Meanwhile Donald, the son of Major Gillies MacBean, who also had taken part in the battle, and had escaped, succeeded his uncle AEneas as Chieftain and Laird of Kinchyle. Obtaining a commission in the first regiment raised by the Hon. Simon Fraser in 1757, he proceeded on service to North America. The trustees whom he left in charge of his affairs, finding them hopelessly embarrassed, sold Kinchyle and the other family estates to Simon Fraser, a Gibraltar merchant, who also purchased the Mackintosh estate of Borlum. After the disbanding of Fraser’s Highlanders in 1763 MacBean became a captain in Lord Drumlanrig’s regiment, and retiring later, lived in 1780 at Teary, near Forres. It seems probable that the succession was carried on by one of the kinsmen named as trustee by Donald MacBean when he went abroad. This Captain-Lieutenant Forbes MacBean of 1757, seems to have been the grandson of Paul MacBean of Kinchyle who infefted his son William in his estates in 1689. The Captain-Lieutenant became General Forbes MacBean, R .A., and according to Mr. A. M. Mackintosh, the historian of Clan Chattan, the representative, through three generations of distinguished soldiers was, in 1903, Archibald MacBean, late captain in the 37th Regiment. The three most important cadets of Clan Vean were the MacBeans of Failie, of Tomatin, and of Drummond. Of these branches the first and last no longer possess their family lands. Only MacBean of Tomatin remains a land-owner in the old country of his clan. Still another branch of the race were the Bains or Baynes of Tulloch in Ross-shire. About the time when the Kinchyle family were being definitely recognised as chieftains a fray occurred at a market in Ross-shire which showed that the Bains of Tulloch were a family of considerable position and esteem. At a market at Logieree on the Conan on Candlemas Day, 1597, a brother of Macleod of Raasay, swaggering about with a "tail" of six or eight henchmen, not only refused to pay for certain wares he had bought, but proceeded to assault the merchant and his wife. Indignant at the outrage, Ian Bain, brother of the Laird of Tulloch, remonstrated with the aggressor. The latter answered scornfully, and from hot words the dispute came to blows. Bain had only his foster-brother to support him, but he slew Macleod and two of his men. The Mackenzies then took the side of the Macleods, while the Munros came into the fray to support Ian Bain. In a running fight as far as Mulchaich several were slain on both sides, but Bain and his foster-brother escaped unhurt, and took refuge with Lord Lovat at Beauly. Lovat not only protected them, but sent his kinsman, Fraser of Phopachie to represent their case at court, with the result that Bain was assoilzied, while proceedings were ordered to be taken against his opponents. Holders of the name of Bain, MacBean, and MacVean have long been outstanding in the municipal and business life of Inverness. In the eighteenth century James Baine, minister of Killearn and Paisley became minister of the first Relief congregation in Edinburgh in 1766, and published a history of modern church reformation. Of the same period was Alexander MacBean, one of the six amanuenses whom Dr. Samuel Johnson employed in the compilation of his dictionary. And in our own day the clan has been able to count such notable members as the late Australian statesman Sir James MacBean, K.C.M.G. ; Alexander MacBain, the well-known antiquary, and man of letters, editor of Reliquiae Celtica and other works; and George Bain, author of the History of Nairnshire, and The River Findhorn, and editor of The Nairnshire Telegraph. Septs of Clan MacBean: Bean, MacBeath, MacBeth, Macilvain, MacVean. MACBEAN,or MACBAIN: The true origin of this race must remain uncertain, for while it is alleged they left Lochaber with Eva, heretrix of Clan Chattan when she married Angus MacKintosh of that Ilk about 1291, other legends describe them as a Moray clan akin to the MacBeaths. That they had early affinity with the Mackintoshes and Clan Chattan is undoubted, for at Harlaw in 1411 they suffered heavily fighting in their cause. It is claimed that a line of MacBain chiefs can be traced through the 14th and 15th centuries but no 'duthus' can be ascertained until 1609, when Angus MacBain, de jure chief, received a charter of the lands of Kinchyle in Dores parish from Campbell of Cawdor. Kinchyle, as representer of his race, signed the Bond of Union between the kindred of Clan Chattan the same year, and in 1672 the clan was officially recognised by Lyon Court as a branch of the Chattan Confederation. Principal cadet families were those of Drummond near Dores; of Faillie in Strathnairn, and Tomatin in Strathdearn. In the Jacobite Rising of 1745 the chief's son was a Major in the Regiment raised for the Prince by 'Colonel Anne', Lady Mackintosh, and many MacBains/MacBeans appear in the 'muster rolls' of the same regiment. Kinchyle was lost in 1760 when lawyers acting for MacBain sold his lands to meet debts while he was fighting the French in America as an officer in the Fraser Highlanders. The chiefly line continued in Canada until 1958 when MacBean of Glen Bean resigned the chiefship in favour of Hughston M. MacBain, a U.S. citizen, who was vested in the chiefly arms as McBain of McBain by decree of Lyon Court in 1959. He recovered part of Kinchyle and created the MacBain Memorial Park there above Loch Ness. The Bains, or Baynes of Tulloch in Ross-shire are regarded as a sept of the Clan Mackay, who also claim origins in the old Royal House of Moray and as Bain/Bean and MacBain/MacBean are interchangeable in the records, with the Beaths and MacBeaths (MacBeths) of Moray and the vicinity, most may well share common origin. Clan MacBain or MacBean who are a sept of the confederation of Clan Chattan, are of ancient origin. They are said to have moved from Lochaber to Badenoch in 1291 accompanying an heiress of the Clan Chattan who was to be married to a Mackintosh. Myles MacBean was a strong supporter of Mackintosh against the Red Comyn and at the Battle of Harlaw in 1411 many MacBains fell fighting for Mackintosh. The principal family were the MacBeans of Kinchyle and in 1959 an American descended from this branch was acknowledged chief by the Lord Lyon King of Arms. There are several other families of the name, some connected to the main family while others appear separate. Some consider themselves to be part of the Camerons and as such fought with Lochiel at Culloden. The MacBains produced some famous soldiers from their ranks. Gillies MacBean, a captain in the Mackintosh Regiment at Culloden killed 14 Hanovarian soldiers before being cut down by the cavalry. William MacBean a private in the 93rd Sutherland Highlanders won the Victoria Cross for killing 11 men during the storming of the Begum Bagh at Lucknow, India in 1858. He later rose to command the regiment. In 1969 the U.S. astronaut Alan Bean, an American Scot carried a square metre of the MacBean tartan with him on his historic Apollo XII space mission to the moon. Below are three family trees and if you look at them closely you will see that they do overlap. They are in PDF format so make sure you have a current copy of Adobe Reader.